Today, Senators Pat Toomey (R-PA) and Doug Jones (D-AL) introduced a bill that would fix the “retail glitch.” The legislation addresses a clerical error in the Tax Cuts and Jobs Act (TCJA) that prevents investments in qualified improvement property (QIP) from qualifying for bonus depreciation. This error significantly increased the after-tax cost of making QIP investments, and reportedly caused businesses to delay, and even turn down, investment opportunities that they otherwise would have pursued. QIP investments include improvements to the inside of commercial buildings: projects such as new flooring, lighting fixtures, sprinkler systems, or other types of remodeling and interior improvements. The TCJA intended to consolidate the various categories of QIP that existed under old law into a new category with a 15-year cost recovery period. This would also have allowed QIP investments to be eligible for the 100 percent bonus depreciation provision created under the new law. However, as written, the TCJA mistakenly excluded QIP from 100 percent bonus depreciation by leaving the cost recovery period unassigned, which results in a greater tax burden than under previous law. The infographic below shows how costly this mistake is. Senators Toomey and Jones’ new bill would assign QIP a 15-year cost recovery period (and a 20-year alternative depreciation schedule cost recovery period), making these investments eligible for bonus depreciation. Importantly, the changes in this bill would take effect as if they were included in the original TCJA. And because the TCJA was scored as though QIP were eligible for the new provision, this fix does not increase the original cost of the new tax law. 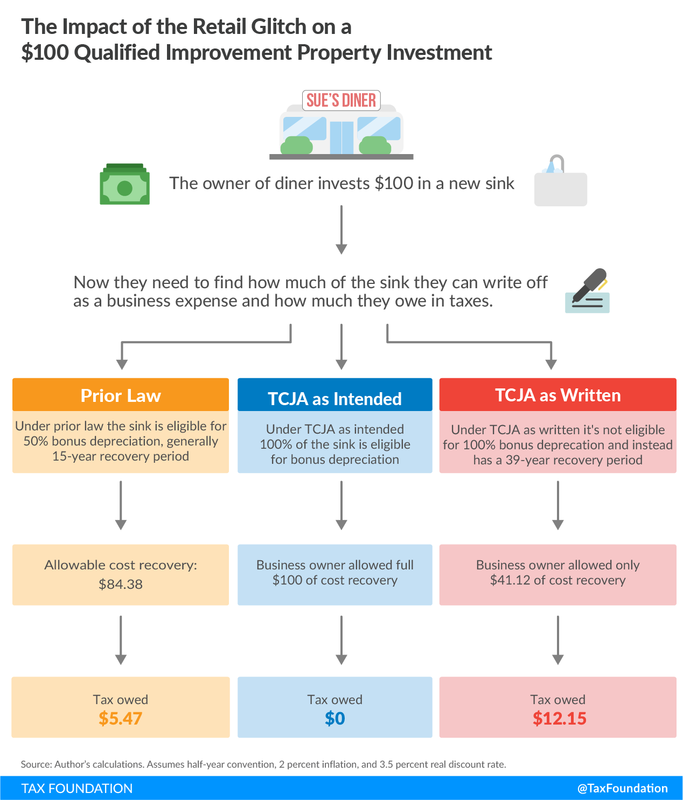 Fixing the retail glitch would mean businesses no longer face more restrictive cost recovery treatment for investments in qualified improvement property than before tax reform.